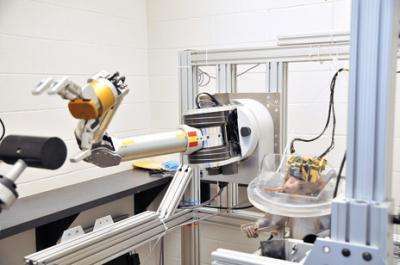 (PhysOrg.com) -- Researchers at the University of Pittsburgh have demonstrated a monkey controlling an advanced robotic arm by using its thoughts. The experiments were led by Dr. Andrew Schwartz, a professor of neurobiology and involved a high degree of complexity in the robotic arm, the level of control, and the intricacy of the manipulations. This is not the first time that Dr. Schwartz implanted sensors in a monkey’s brain to control a robotic arm. Back in May of 2008 experiments were conducted by Dr. Schwartz, using a simpler mechanical arm, to teach a monkey to feed itself. This was a four-degrees-of-freedom arm with shoulder joints, elbow, and a simple gripper. In the video above monkeys in the Dr. Schwartz’s lab are able to move a robotic arm to feed themselves marshmallows and chunks of fruit while their own arms are restrained. In the experiments conducted this year two sensors were implanted into the monkey’s brain. One was implanted in the hand area and the second in the arm area of its motor cortex. The sensors monitor the firing of motor neurons and send data to the computer that translates the patterns into commands that control the robotic arm. In the video above the monkey (right side of video) uses its right arm to tap a button which triggers the robotic manipulator to position a black knob to an arbitrary position. The monkey is then seen controlling its articulated robotic arm to grasp the knob. After touching the knob the monkey places its mouth on a straw to be rewarded with a drink. By constant repetition the monkey eventually starts placing its mouth on the straw before touching the knob knowing that a drink is coming. This advanced robotic arm has seven-degrees-of-freedom as compared to the four-degrees-of-freedom arm back in 2008. The added three more degrees of freedom adds an articulated wrist which can perform pitch, roll and yaw movements. These movements enable the monkey to precisely turn the knob by rotating the mechanical wrist. By putting the brain in direct communications with machines, researchers will one day be able to engineer and operate advanced prosthetics in a natural way to help paralyzed people live a close to normal life. As of this writing Dr. Schwartz and his colleagues have not published the detailed results of their latest experiments. Once this technology is fully developed and safe, they should donate free robotic limbs to the injured veterans. I wonder if this could work beyond prosthetics. What would happen if the monkey's arms weren't restrained? I'd expect some sort of mirroring behaviour, mechanical arm moving the same as the organic one, initially, but maybe with training the movements can be separated. Definitely needs human subjects, though. Don't really see why they haven't moved on yet. Unrelated question: why would anyone disagree with the idea of veterans, or anyone for that matter, receiving robotic limb donations? "Unrelated question: why would anyone disagree with the idea of veterans, or anyone for that matter, receiving robotic limb donations?" Tell that to some guy who lost his livelihood over these injuries. Wow. There is no dishonor in recieving medical treatment and the best technology available. These veterans deserve the best care available, and they deserve not to have to pay for it. Also, they didn't die/get wounded over seas for "capitalism". Capitalism is no more "pro-american" than any other economics model. It is also no more constitutional than communism. And guess what? All governments are necessarily communistic. What are roads and bridges if not communistic public venues? What are public school system? Communistic. As for profit, everyone profits when everyone is healthy and well educated. Yay. Give paid killers the benefit of technology first! If not for those "paid killers" you can be sure that muslims everywhere would destroy our way of life...free of charge. I think the next logical step would be to make a completely mobile robot controlled by monkeys, then canvas our enemies with marshmallows. QuaCon, having written my first comment with a healthy dose of irony, I was fully ready to agree with your repsponse... Then you started bashing Muslims. Oy. And antialias, it's hardly fair to call our soldiers paid killers. They're not paid very well, and from what I hear, having to kill someone isn't really much fun. The arm just starts throttling the scientist. "Get your robot hand off me you damned dirty ape!" The monkeys have mechanized, I for one welcome our simian overlords. The arm is the beginning! Beware of MonkeyNet! MonkeyNet will send terminapers! I'll bet that monkey would like to use that arm to throw feces at the researchers. So? I'm not being paid all that much and sometimes my job isn't fun, either. Does that mean it's not my job? I don't understand why they are still implanting electrodes into monkeys' brains. We currently have non-intrusive ways to do the same thing (see video above). You can control your computer with your mind. en.wikipedia.org/wiki/Emotiv_Systems If they were simulating nervous system feedback, I'd understand it better. I'm with kasen. They should have four armed men and women running around. What's the hold up? Good article, very important and beneficial tecnology not to mention just plain fasinating. But why does the article's title give me flashbacks to 1950s Japanese horror films such as Godzilla? The research is probably already funded by the government and I'm sure once it's safe, the DoD will be offering these to disabled vets who opt for the surgery. Uncle Sam (finally) spares no expense in helping disabled vets lead the most normal lives possible. Actually, if you surf the related youtube links, you'll see there already have been human subjects, albeit using far less invasive technology. No, but as far as I can tell no one is calling your humanity into question. Soldiers risk life, limb and psyche in our defense. They deserve some respect. Snort. No they don't. They risk their lives so that some rich guy can get richer. They're low IQ lowlifes who want to make a buck sitting around playing with expensive toys making the world an unsafer place for everyone. By putting the decision when and where they will kill other people into the hands of others they have effectively reached the absolute nadir of ethics and morals. No. No respect from me for people who haven't got enough braincells to realize that pointing guns at others doesn't make the world a better place. And I suppose you feel the same for those who fought and stopped the Nazi machine in Europe and police who point guns at bad guys who want to harm the innocent? If you ever should need police protection in the future, be sure to tell them your opinions of them before they decide to go into harms way to save your ungrateful self. If you ever should need police protection in the future, be sure to tell them your opinions of them before they decide to go into harms way to save your ungrateful self. No. If you think you need a bunch of thugs with guns then I'm sorry: you are not capable of thinking at all. Antialias, it's a good thing I know you don't believe all that because you'd be totally nuts if you did! I suppose you've never heard of SWAT? Philosophy and its precursory emotion - the viral enemy of clear thinking have invaded this topic. Back on topic... Once this technology is "perfected" not just singular robotic limbs but enchanced robotic systems could be developed. Just imagine workers "being there" with enhanced capacities if say, an oil well head ruptures 1 mile below the surface. Any situation really where the flesh is either too valuable or too weak. The system "driver" doesn't have to actually be there; a fiber-optic or wireless link could transmit all the command and feedback signals needed. Sounds just like a Star Trek TNG episode where Geordi does just that.